At a time when Arizona is still striving for economic recovery, the AZ Legislature passed SB1062, a bill that was bad for Arizona business. The 2015 NFL Super Bowl which brings in $500-700M alone was put in jeopardy. We lost jobs as companies chose not to come to Arizona and we lost conventions vital to the tourism industry. Arizona’s business community overwhelmingly spoke out to urge the Governor’s veto of the bill. My opponent introduced this bill. It is time to put an end to fiscally irresponsible governance. Attracting businesses, growing new industries and advancing our technology sectors are my priorities. A prosperous Arizona is one that is open for business and puts Arizonans back to work! Growing the job market is only a part of the solution. Arizona must also have the world-class educated and trained workforce to perform these jobs and that requires strengthening our K-12 public education and retaining our college and university graduates. 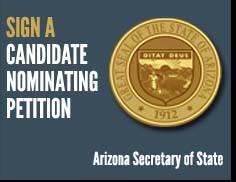 As your State Senator, I will work hard to do what is right for all Arizonans!